New Chromebook ‘Coral’ Begins Development And It’s Braswell? The next generation of Chromebooks, equipped with the latest Apollo Lake chipset from Intel, are about to hit the shelves. Understandably, news of another Braswell-based Chromebook may not excite many. Here at Chrome Unboxed we’re a bit of an exception to that rule. A new Chromebook is a new Chromebook and today I’m excited to share yet another upcoming device with you. In case you’re wondering, Braswell chips are Intel’s previous generation, entry-level processor for PCs. Many of the devices you see on the market currently house this chipset and it has proven itself as a worthy foundation in consumer Chromebooks for the casual to moderate user. As a matter of fact, the Chromebook world has become inundated with Braswell devices. Almost every manufacturer besides Google and a couple of others that don’t manufacture Chromebooks anymore have a Braswell device on the market. Models such as the very popular Acer Chromebook 14, the Acer R11 convertible or the HP Chromebook 11 G5 are powered by the Braswell chip and these are great Chromebooks that won’t break the bank. There are so many options out there with this processor but, to quote a colleague, “the Braswell chip has gotten a bit long in the tooth.” The Braswell-based Acer Chromebook R11 was released in December of 2015. That’s almost a year an a half ago. That’s an eternity in the tech world. Intel’s latest chip, Apollo Lake, was made available September 1 of 2016. You would think the Braswell horse would be ready to retire. But it’s not. Here’s why. Braswell processors may be on their way out the door but they haven’t outlived their usefulness. The new Apollo Lake devices that are heading our way have shown preliminary performance increases of roughly 25%. That’s a huge jump for a single generation gap. We’ve tested one of these devices here in the office and can attest to the fact that the Apollo Lake chip is creeping very closely to bridging the gap between itself and the more powerful Pentium chips. But it comes with a cost. The upcoming Apollo Lake-based Chromebooks will put you out and estimated $329-$350 at the bare minimum. Due, in part, to the newer processor but also because the latest and greatest Chromebooks have a lot of new features you don’t see on last years devices. You’ve got dual cameras, mandatory USB-C, touchscreens a-plenty and more. All those bells and whistles cost dollars. That doesn’t mean the Braswell-based Chromebooks are yesterday’s news, however. My trusty, Gold Acer 14 is a beautiful machine. It has the feel and look of a MacBook, an HD display, better-than-average trackpad and a great keyboard. And frankly, until all the newfangled options become the norm, I don’t even notice they’re not there. Aside from the lack of an SD card ready, the Acer 14 has never once left me wishing it had something it didn’t. Did I mention that it looks really good? For the average user, a Braswell-based Chromebook is more than enough to accomplish daily tasks. Online banking, documents, social media or even bingeing your favorite show are all done with ease on one of these devices. On top of all that, you can grab this Chromebook or any number of devices with similar internals for as little as $200 if you shop around. I picked up a used Acer R11 for $120 and it’s a touchscreen convertible with Android Apps available now! See my point? Sure, you’ve got power users that are going to buy the top-of-the-line out of necessity. Then, you have guys like Robby and myself who can’t keep a device for more than a month before it’s time to check out something new. (In our defense, this is sort of our job. So, it’s really research and development. Sounds legit, right?) We can’t forget the education sector either. They are largely responsible for the exponential explosion of Chromebook popularity. They need durable, rugged devices and they aren’t exactly cheap. But what about you? What about the average Joe who just wants to get his daughter a nice looking Chromebook that fits her needs and won’t cost you a weeks pay? I worked in the auto industry for a number of years and I can tell you, the majority of consumers fall right in the middle. Sure, I saw my fair share of fancy rides and people who dropped $70K on a car without blinking but the majority of my clients were the practical ones, who just wanted something nice at a reasonable price. In the early hours this morning a new board was added to the Chromium repository. 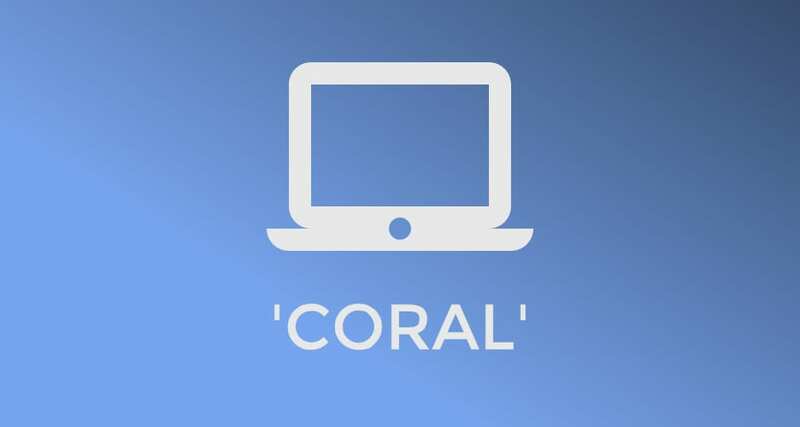 Codenamed ‘Coral’, no other details have been revealed about the device at this time. Over the next few days I’m sure we will get bits and pieces about this new device and with any luck identify the manufacturer. The features on this Chromebook could vary greatly. As I stated earlier, the Braswell chip is housed in a large number of devices from education models to traditional clamshells and even touchscreen convertibles. You can see the commit for yourself here. If you scour the repository change you might notice there is no mention of the Braswell chipset. Generally, as it applies to Intel boards, you never will see an identifying mark of the particular processor. Most often we will reference the board overlay and find the devices “parent” board. That information gives us the processor based on devices already in production. For example, older Baytrail-based Chromebooks all used the baseboard codenamed ‘Rambi’. If a device uses this baseboard, odds are it is a Baytrail processor. This isn’t the case 100% of the time but it is a general rule of thumb with only a handful of exceptions. ‘Coral’ has yet to provide us that bit of data but a little deductive reasoning is how I came up with a Braswell processor. On the Chromium developer’s list of devices there are eleven Braswell-based Chromebooks. All of them have the same baseboard, ‘Strago’. If you aren’t familiar with that name it is a character from the popular Final Fantasy game franchise. Now, out of the eleven Chromebooks, all of them save one have their own unique codename that is also a character from Final Fantasy. (the one that isn’t is a white label device which is a generic board used by multiple manufacturers) My Acer Chromebook 14, for example, is named ‘Edgar’. Edgar also happens to be a playable character from Final Fantasy VI. Other boards include reks, setzer, ultima and banon, all characters from Final Fantasy. It just so happens that ‘Coral’ is also a character from Final Fantasy IX. There is always the possibility that I’m wrong on this but I seriously doubt it. It looks like someone is about to manufacture another Braswell-based Chrome OS device to take advantage of the middle-market that is about to erupt. Even with specs like the Acer Chromebook 14 and the addition of USB-C a device like this could fall in the sub-$300 range and be a hot seller to the masses. I’ll keep tabs on ‘Coral’ and see what we can expect to see when it finally emerges. Quick Tip: If you don’t know the codename of your Chromebook, it’s easy to find. Just head to your settings menu and click the About Chrome OS link. There you can see your Chrome OS version, ARC version and the board name of your device.